We’ve all been there… You’ve planned this trip for weeks, reviewed the route many times to get the perfect blend of challenging scrambling and great views, you’ve discussed it on Facebook with your mates and everyone is set… Except : you’ve been checking the Mountain Weather Information Service – and it’s looking really ominous! For most of us who don’t live close to the mountains, we have to plan trips well in advance. There’s seldom a chance to change dates at short notice – but unfortunately you also have to be realistic and safe, especially in Winter. Heading off for that airy ridge scramble when the forecast includes storms and 80 mph gusts (as happened to us just after Christmas), puts you just the wrong side of sensible. So is their a solution which protects that precious day in the hills, but ensures we get home in one piece ? Well, if you’re heading for Snowdonia there is a perfect route – and it’s quite possible that that storm will create the ideal conditions for an epic day out and put that smile on your (rather wet) face. The trick is to use the geography to your advantage – and the cliffs surrounding idyllic Llyn Idwal create that perfect wind break, as well as providing a great scrambling route up towards the summit of Y Garn. The wind may be howling – but it’s passing harmlessly 100’s of feet over our heads. 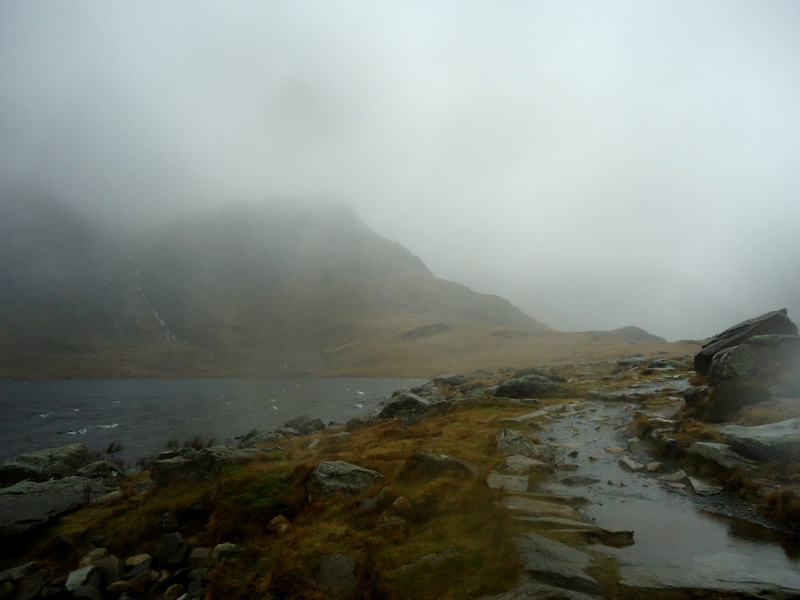 The route starts at the car park by Idwal cottage at the West end of Llyn Ogwen. Take the track by the side of the YHA, turning right towards Llyn Idwal after about 1/2 a mile. Llyn Idwal has the most perfect location, tucked in around the base of Y Garn and backed by a circle of typical gnarly Glyderau cliffs. Take the path to the right hand side of the lake and follow the track around the Western shore. 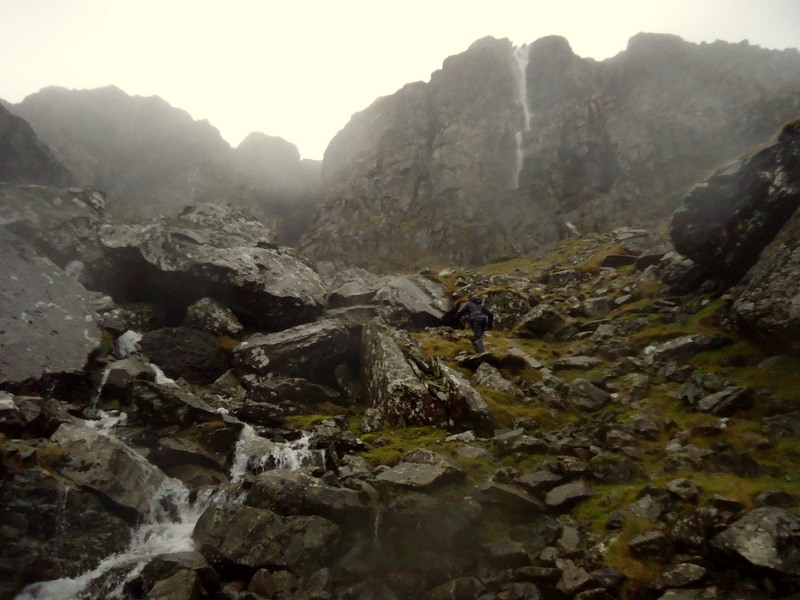 The track climbs slightly, then contours around the base of the Y Garn cliffs aiming for a cleft in the rock wall – the well named Devils Kitchen. 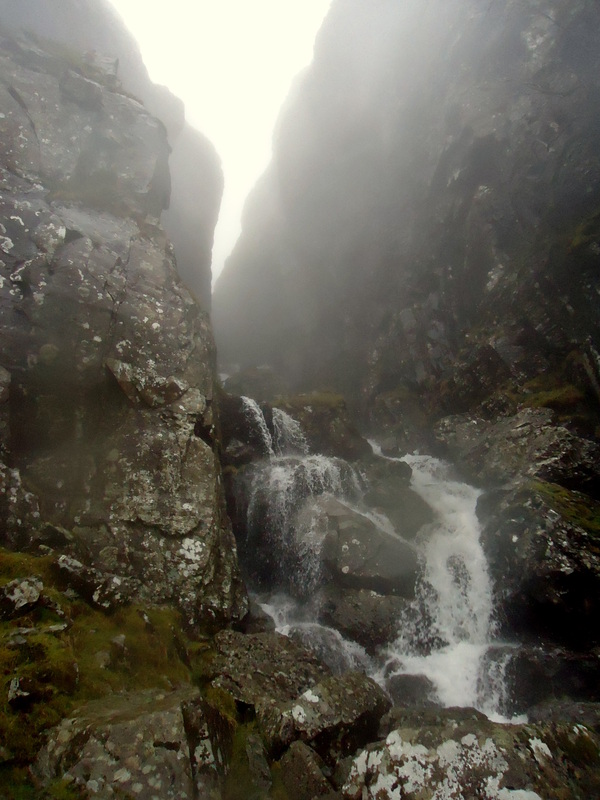 As you reach the South end of the lake the track begins to rise quite steeply, becoming less distinct and morphing into a stream-bed scramble, complete with waterfall ascents. 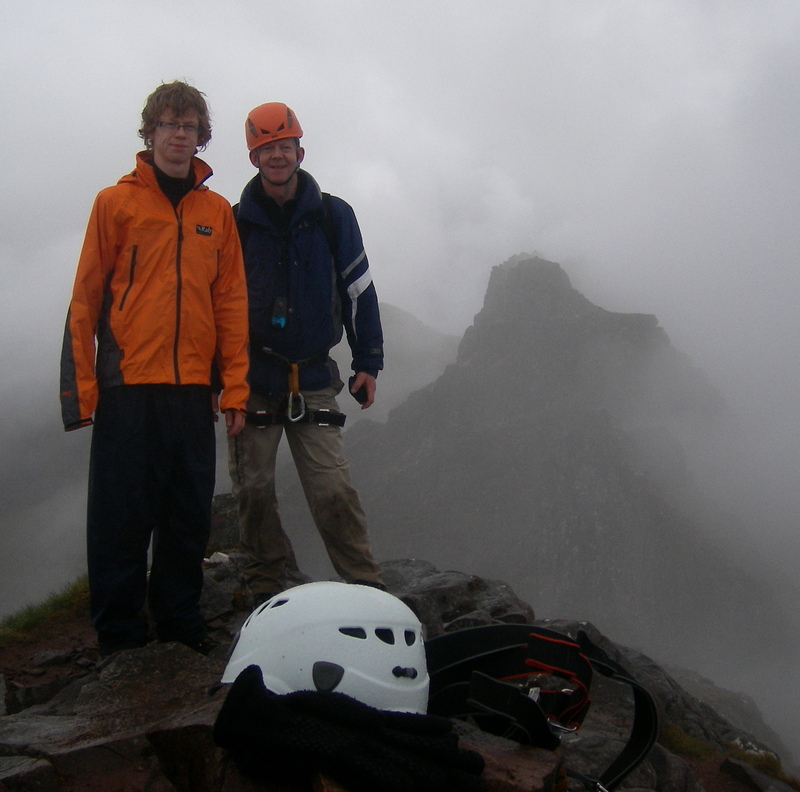 As long as you aim for the rock cleft you can’t go too far wrong – and the wind and rain really heighten the atmosphere. Once you reach the entry to the main ‘kitchen’ rift, check the amount of water flowing out. This is normally a fun scramble, but when you’ve had days or weeks of rain you can feel like a salmon swimming up a rocky stream. On days like that, take the track to the left hand side, which takes you around the rock cliff to eventually reach Llyn Cwn. If it’s really stormy, watch out for those gusts as you emerge from the protection of the cliff face. In our case we suddenly started to feel the full force of those 80 mph winds, so we turned back before we took off ! No matter though : we’d had a fantastic day’s scrambling in the high Glyderau range – on a day when we would normally have had to accept defeat. So : next time you’ve planned a mountain adventure and the MWIS forecasts storm force Westerly winds, check the map for routes which walk up into those corries and under those cliffs. Be prepared to modify your route on the fly and keep safe, but if you’re lucky, that dark storm might just be what turns the day into a memorable mountain expedition! 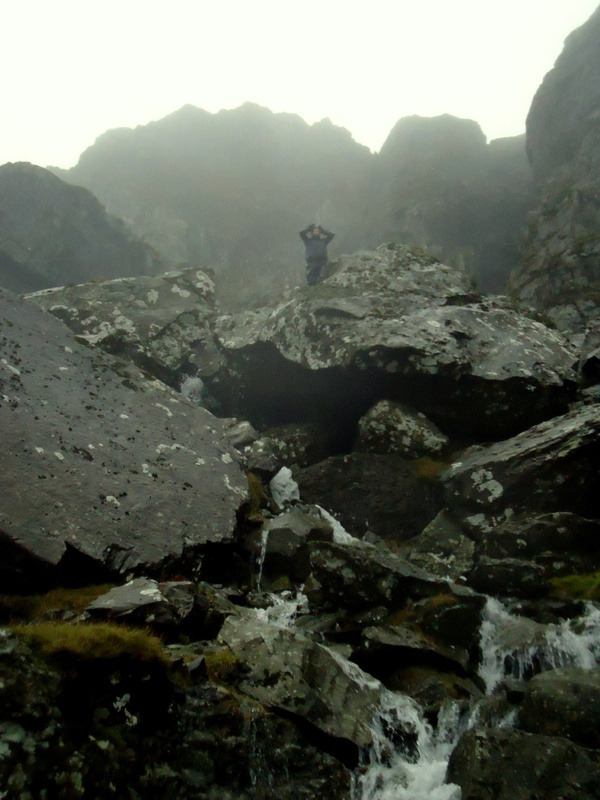 This entry was posted in Snowdonia and tagged Devils Kitchen, Llyn Idwal, Scrambling, Snowdonia, storm winds, Wales, Y Garn. Bookmark the permalink. 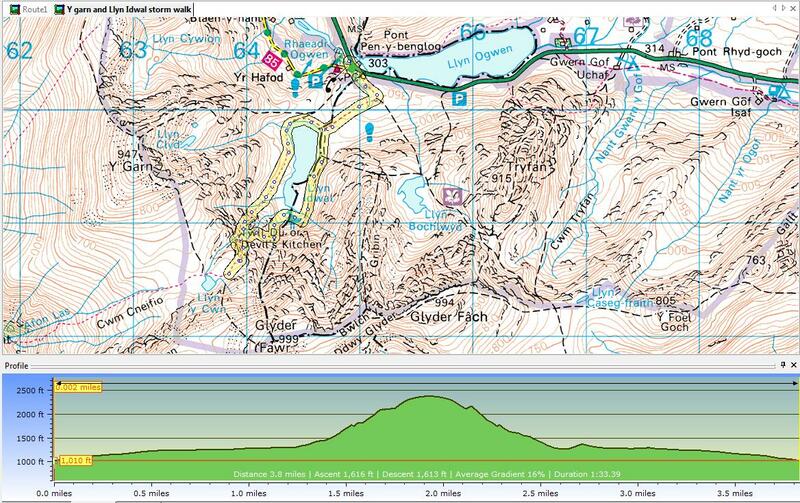 ← Beinn Eighe : the greatest wild swimming in the World ?